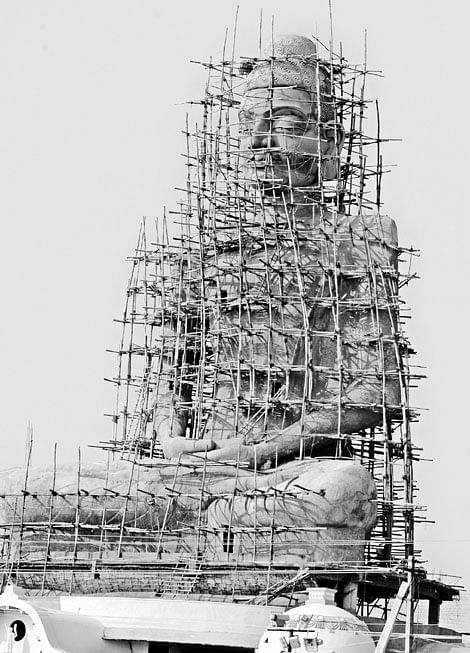 The tourism authorities have taken all the necessary steps to complete the much-delayed Dhyana Buddha project and unveil the 125-foot tall Buddha statute during the three-day Buddha Jayanthi celebrations to be held from May 14 at Amaravathi in Guntur district. Of the Rs 40 lakh sanctioned by the department in this connection, Rs 10 lakh has been released recently and the works are going on at a brisk pace, said AP Tourism divisional manager (Vijayawada) Juvvadi Raghupati Rao. The Dhyana Buddha project was conceived and executed by Social Welfare joint director Regulla Mallikarjuna Rao in 2004 with the funding of Guntur district collector. But, the tourism department took it over in 2007. More than Rs 3 crore has already been spent on the project, say sources. Meanwhile, the Buddha statue has been designed by incorporating features from all the 50 types of Buddhist sculptures seen at 145 major heritage sites across India. The essence of the Buddhist teachings found in 24 chapters and 424 stanzas have also been carved on 200 panels in the main hall of the Dhyana Mandiram. The Dalai Lama, who visited the place during Kalachakra in 2006, donated `30 lakh and promised to provide 300 volumes of Buddhist literature to develop the place as an international Buddhist study centre. He is likely to attend the Buddha Jayanthi celebrations at Amaravathi in May for the second time. Meanwhile, the tourism officials are also taking measures for completing the roof-level restaurant, Raghupathi Rao said. The AP Tourism is also developing other tourist and pilgrim centres including Kondaveedu Fort (at a cost of `85 lakh), Vundavally Caves, Uuppaldu Bird Sanctuary (`15 lakh each) and Karampudi Veerla Gudi (the temple of warriors at `60 lakh), he added.